Few have what it takes to make it to the Octagon. These athletes are not born - they're built. It's not enough to be able to throw a punch. A UFC fighter needs to be ready for anything his opponent brings to the Octagon and trained in a variety of skills and techniques. Learn more about strikes, clinching, take downs, ground, and submission holds. UFC fighters train in a variety of disciplines. Learn more about their origins. Not all fighters are created equal. UFC requires discipline, endurance, intense training, and exceptional nutrition. 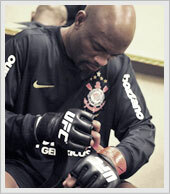 Learn about what it really takes to make the cut and step into The Octagon™.